Restore dull aluminum to a brilliant shine! The BLACKFIRE Aluminum Polishing Kit is a four step system designed to bring back a mirror-like shine to aluminum and other polishable metals. Imagine aluminum that shines like chrome! Use this kit on aluminum, brass, copper, magnesium, and blended metals. Each polish works in sequence to improve upon the results of the previous polish. Take your vehicle's metal components from dull and oxidized to shiny and reflective with the BLACKFIRE Aluminum Polishing Kit. BLACKFIRE Heavy Cut Aluminum Polish is a pre-polish designed to restore weathered, chalky, dull, and spotted bare metals. It can be used with great results on aluminum, brass, copper, magnesium, and blended metals. As step 1 in the BLACKFIRE Metal Polishing System, BLACKFIRE Heavy Cut Aluminum Polish removes surface rust from chrome and stains from stainless steel. BLACKFIRE Heavy Cut Aluminum Polish is designed to be buffed with an Acrylic Wool Pad on a rotary machine polisher. Polish with a circular machine polisher at 1,500 rpm, using a firm pressure. BLACKFIRE Fine Cut Aluminum Polish is step two of the BLACKFIRE Metal Polishing System. It removes minor oxidation, haze, light blemishes and it restores a brilliant shine on bare metals such as aluminum, brass, copper, magnesium and blended metals. 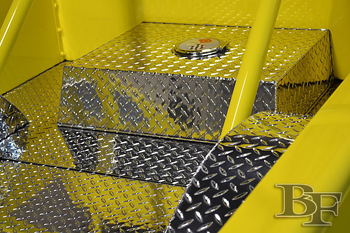 BLACKFIRE Fine Cut Aluminum Polish quickly shines chrome and restores a like-new finish on stainless steel. It's the ultimate polish for bare metals! BLACKFIRE Fine Cut Aluminum Polish is designed to be buffed with an Acrylic Wool Polishing Pad on a circular machine polisher. Polish with a rotary polisher at 1,200 rpm using medium pressure. BLACKFIRE Wet Diamond Aluminum Show Polish is a finishing polish for aluminum that has already been polished with BLACKFIRE Fine Cut Aluminum Polish. It takes the existing bright, chrome-like shine and further burnishes the finish to a mirror-like shine. The same polymers found in Wet Diamond All Finish Paint Protection are found in this outstanding polish to help maintain the reflective luster. BLACKFIRE Wet Diamond All Metal Sealant protects all metal surfaces with a revolutionary acrylic polymer that withstands heat and bonds to metal surfaces – perfect for auto use. BLACKFIRE creates an extremely slick finish that sheds water effortlessly, helping to prevent water spots. BLACKFIRE Wet Diamond All Metal Sealant prolongs the beauty of just-polished metals and maximizes the time between polishing. BLACKFIRE Wet Diamond All Metal Sealant is designed for protection of daily drivers and any metal surfaces that regularly come into contact with the elements. Wolfgang Finger Pockets are the easiest way to clean or polish tight places. These foam pockets fit over three or four fingers so you can maneuver in small spots. The foam has light cutting power so its perfect for polishing metal components. Finger Pockets allow you to reach between the slats in your vehicle’s grill or between spokes. The foam is more absorbent than a towel so it’s great for product application. 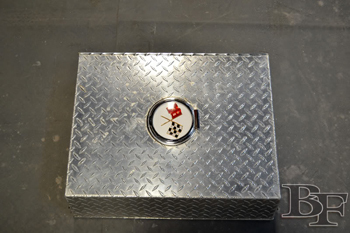 The BLACKFIRE Aluminum Polishing Kit is a four step process. You may not need to use every polish on every surface. Always try BLACKFIRE Fine Cut Aluminum Polish first to see if it will deliver the desired results. If not, then proceed to BLACKFIRE Heavy Cut Aluminum Polish. For heavy oxidation, apply BLACKFIRE aluminum polishes with wool pads on a rotary polisher. Turn back time on bare metals with the BLACKFIRE Aluminum Polishing Kit! A total retail value of $193.91. Save $33.92!